During pregnancy your body goes through some huge changes such as a growing belly, weight gain and fluctuating hormones that can often leave the skin feeling dry and itchy. When this happens, it is common for stretch marks to appear. Although there is often no way of avoiding them no matter how much oil you rub on your belly, it is important to keep your skin nourished and hydrated. Did you know that 80% of what we apply to our skin is absorbed directly into our blood stream? When you are pregnant the chemicals that are absorbed into the bloodstream are crossed over to the placenta. This is why it is so important to be using products that do not contain chemicals such as petroleum (yes, some actually contain this horrible ingredient). 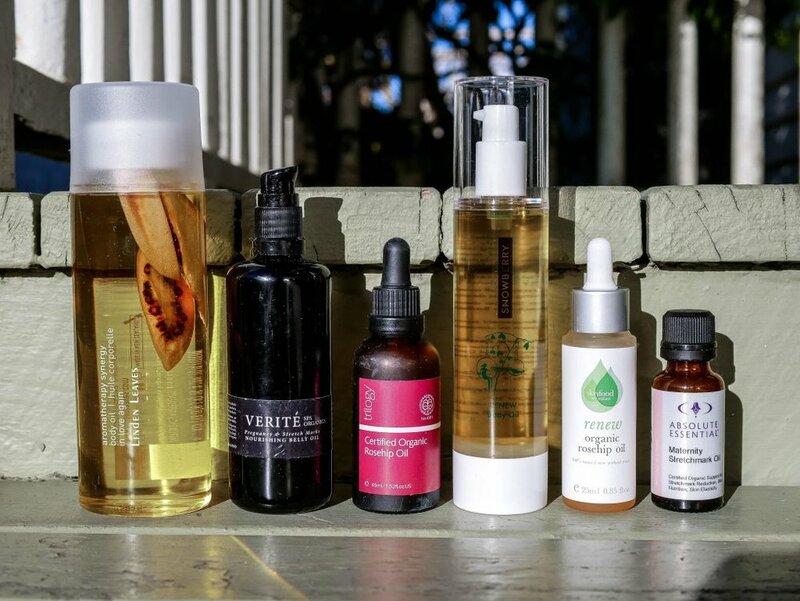 When I looked at some of the pregnancy oils on the market I was shocked at the amount of chemicals some of them contain. After my shower every evening, I like to apply the belly oil when my skin is still warm and damp. It can be used on other growing areas that are prone to stretch marks such as thighs and breasts. Belly oil is also great to use on any sore and achey areas of your body such as your feet or legs as it works the same way a massage oil does. Below, I have listed my favourite oils that are on the market. Linden Leaves In love again body oil A New Zealand made product that is not tested on animals and is 100% natural and organic. This oil contains Rosehip, Avocado, Almond and Apricot Kernal Oils and the bottle contains real Tamarillo and Strawberry. Verite Spa Pregnancy & Stretchmarks Nourishing Belly Oil This pregnancy & stretchmark oil contains Rosehip, Argan and Hemp Oil. It is 100% natural and all the products are made in New Zealand. It also contains essential oils so it smells amazing! All products are vegan and not tested on animals. Trilogy Rose Hip Oil This oil contains 100% rosehip which makes it high in essential fatty acids (omega, 3 & 6). Rosehip is known to help reduce the appearance of stretch marks, scars, wrinkles and helps to hydrate dry skin. Snowberry Renew Body Oil This product contains Macadamia, Pumpkin, Sunflower, Sweet Almond and Rosehip Oil. It also contains Harakeke seed oil, which is high in phytosterols, these help to regulate healthy skin cell rejuvenation and repair. Skinfood Organic Rosehip Oil Skinfood Rosehip Oil is 100% organic and contains Rosehip and Sweet Orange Oil. The sweet orange oil leaves you smelling fresh and leaves you feeling uplifted. It is non-greasy. Skinfood have recently released Little Skinfood, this is range of products for Mother's, Babies and Toddlers. Absolute Essential Maternity Stretchmark Oil This product contains Avocado, Calendula, Almond, Lavender, Evening Primrose, Apricot Kernal, Jojoba and Mandarin Oil. It is one of the best smelling oils and all the ingredients help to feed the skin and support skin elasticity. Absolute Essential have a range of oils specifically for Mother and Child. All of these oils listed are made from the most natural and highest quality ingredients. I like to use oils over creams as they have less ingredients which usually means less nasties. Oils are also more absorbent.